He then listed off multiple steps the president would take to sabotage his own re-election. “Let’s see, he might start by proposing more than half a billion dollars in Medicare cuts. That’s something that nobody outside the libertarian symposia circuit really wants to see. 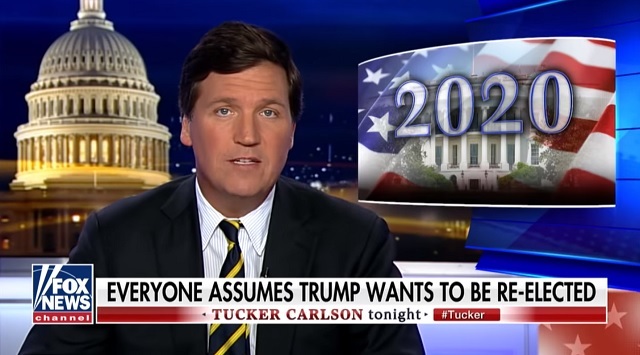 Then he’d slash funding for the E-Verify program that would allow companies to keep hiring illegal alien labor in violation of a key campaign promise,” Carlson said, referring to a series of ideas people in Trump’s world floated recently. Trump supported a 25-cent-per-gallon hike in the gas tax, media reports from 2018 show. Trump also said he was “open to other ways” to pay for a major infrastructure build-out. Republican lawmakers generally oppose gas tax hike proposals, with some saying it would punish Americans’ pocketbooks. A 25-cent gas tax hike would increase the tax from 18.3 cents to 43.3 cents per gallon. The caveat, of course, is that Trump is doing everything on the list. It's all quite frustrating, especially considering Trump keeps saying he wants to address many of these issues only to not follow through on anything (or do the opposite). Just this week, he threatened to close the border with Mexico only to cave immediately. All he needs to do is tell Jared Kushner to take a hike and appoint competent people who actually support the agenda he ran on but apparently that's asking too much.